Does converting to Oxfordianism increase your appreciation of the work, as many Oxfordians claim? 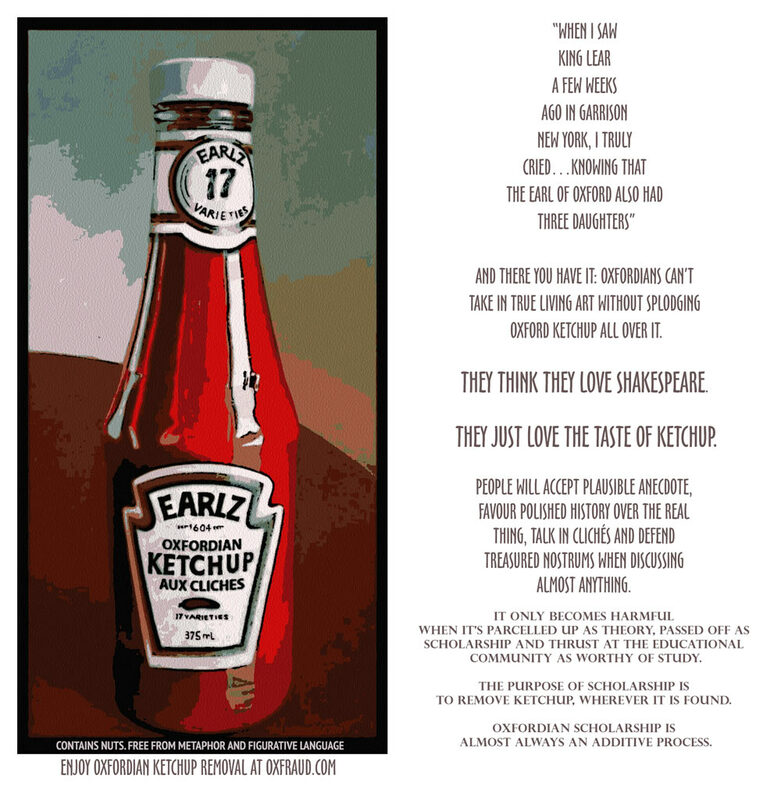 Nat Whilk likens it to ketchup on gourmet cooking, creating such an accurate picture of how faint praise can damn creative effort, we decided to indulge in a few riffs on the theme. First the Oxfordian post which triggered our imagination, from Barabara Hobens Feldt. Posting on a thread attached to Annie Martirosyan's Amazon review of Shakespeare Beyond Doubt, Barbara is indulging in the time-dishonoured 'elite knowledge' argument as she builds to her rhapsodic climax. Only those who profit from the name hold on that "earth is flat" theory. Even my literature professor in the early`70's pointed out the glaring truth. Only a man well placed in the Court would know such things.... She said that once we visited his birthplace, we would certainly know. And there it is, staring the Lost Boy(s) in the face... no facts of his life to point to, no intense education as de Vere had, no trips to Italy, no will or goods left behind, nothing but trips back and forth to London and a string of Judge Judy-type lawsuits. Stooges??? Schtick? Nah. The Truth! The history is all there. Open up your eyes, talk to the "birth place" folk - LOL - and start reading. What a most amazing door will open once you read about the life of Edward de Vere - - the "click click click" of OMG reality will send you reeling....right back to re-reading every play, every sonnet, and understanding the true genius of the man. When I saw King Lear a few weeks ago in Garrison NY I truly cried...knowing that the Earl of Oxford also had three daughters. Nat's reply seemed a good enough aperçu to be carved in tablets of stone. However, to make it more generally useful, we decided to incorporate it into our first ever greetings card. And we may yet extend it to a ketchup rating system for Oxfordian posts and articles. Before ketchup’s on your dreams. Oxfordians object. 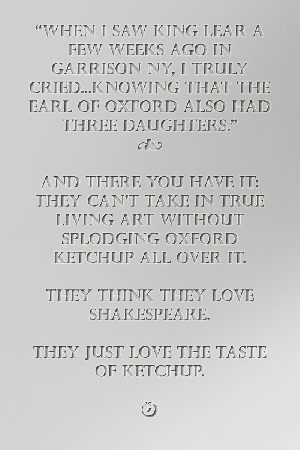 They claim that Shakespeareans use ketchup too. But here's the problem. When it is all removed, the plate is not empty. There is a meal there that can only have been cooked by genius and there is enough on it to reveal him to be Will, the man from Stratford. On the plate we have the best cooked bacon in the world, but it's from Warwickshire Old Spots, the mushrooms are just-picked funghi selvatici from the Forest of Arden, the eggs are from Stratford Blue Gold Bantams and the pasta shapes, on closer inspection, aren't pasta but turn out to be carefully constructed, tortelli-shaped concoctions of mussels, beef, cod and lots of other things normally served with pasta. There are condiments everywhere but if you hold the ketchup you'll realise you're eating breakfast at Heston Blumethal's. 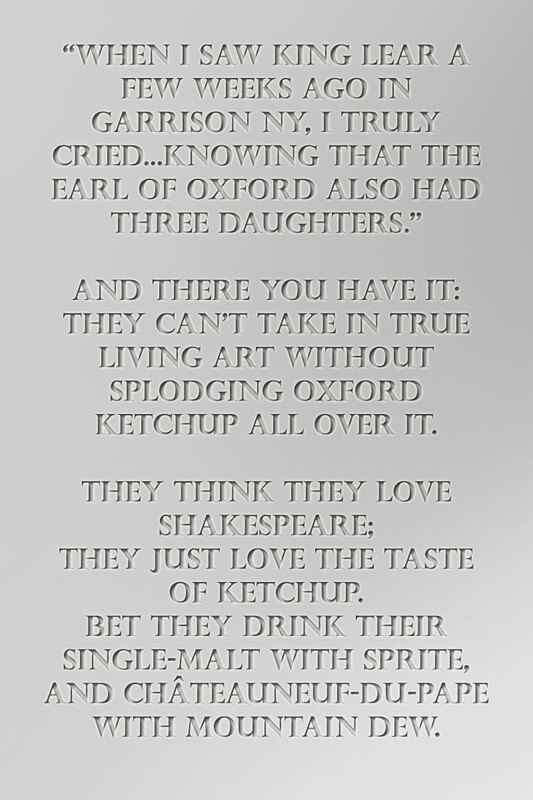 Use half a bottle, like an Oxfordian, and you may well cover all the links to Stratford but you might as well be eating at Macdonalds.